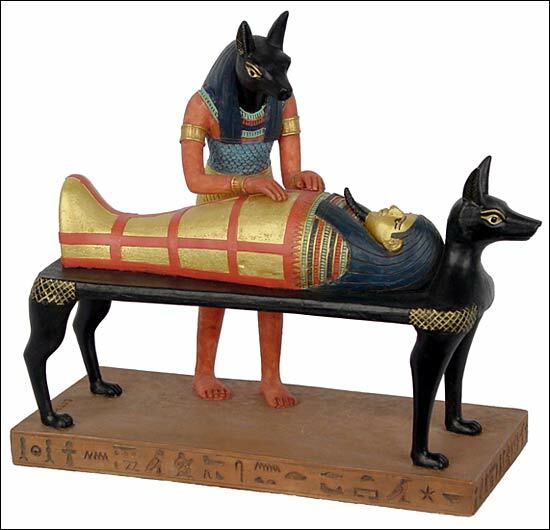 The God Anubis is represented here embalming the body of the high official Sennedjem. The term embalming (Senefer) means �to give vitality again� and the embalming house (per nefer) means �the house of vitality�. For the Egyptians, death was transitory and the mummification allowed the deceased to be prepared for the trip to the underworld and immortality. The process of mummification lasted seventy days. First, the body had ritual washings, then, most of the brain was taken out through an opening in the nose. The rest was dissolved with aromatic products. The heart, lungs and viscera were taken out and placed in four jars. The heart was replaced by one of ceramic or stone. The body submerged for seventy days in dry natron became incorruptible and finally it was washed, dried and bandaged with fine linen at the same time that sacred formulas were chanted.